Draw your heroes… and get their autographs! Which football fans haven’t had a go at illustrating their heroes with pencil and paper some time in their life? But not everyone was as enterprising as a young Christopher Worrall, who used his ingenuity to acquire the signatures of his heroes. In an attempt to stay ‘on message’, note this supporter’s respect for the commercial side of the game, with nods to Phoenix Brewery and Adidas, two great names associated with Albion in the mid-1980s. Both are highly evocative of those times and fondly remembered, unlike, say, Focus DIY in the 1990s. 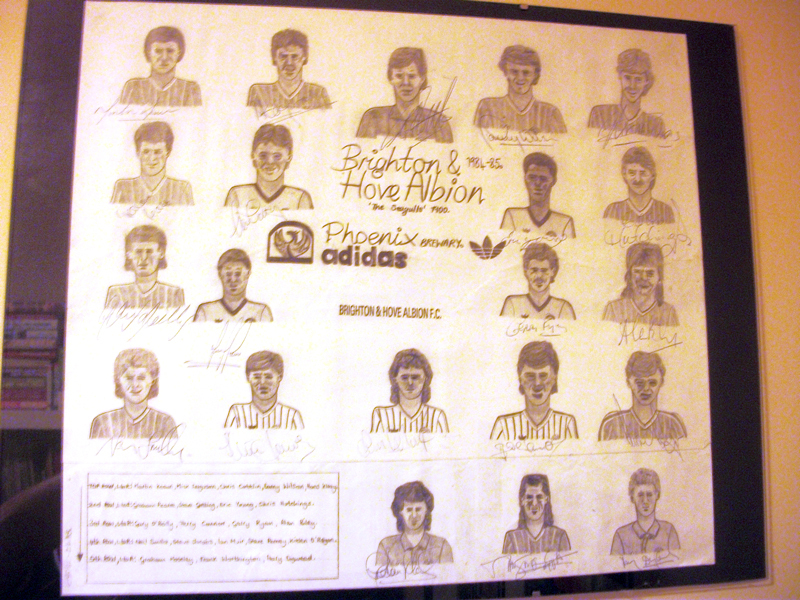 This is my rather unique collection of Albion autographs from 1984/85. I drew the squad, rolled it up, shoved it in a tube and sent it to the Goldstone. Back it came, as requested, fully autographed and given the official club stamp. Still to this day on my study wall, 29 years later! Keown, Ferguson, Cattlin, Wilson, Kraay, Pearce, Gatting, Young, Hutchings, O’Reilly, Connor, Ryan, Biley, Smillie, Jacobs, Muir, Penney, O’Regan, Moseley, Worthington and Digweed are all here, drawn in home, away and third kits. A splendid, creative effort, Chris! Cracking stuff – wonderful piece of unique memorabilia! Thanks for this, I’m chuffed to bits to see it on the blog! Chris. Incidentally I’m on the Fan Mosaic at the Amex holding this pic!